As I flew into The Netherlands, I marveled at the greenery. Verdant fields stretched to the horizon. I soon found out why. It rained a lot, at least during my short stay. 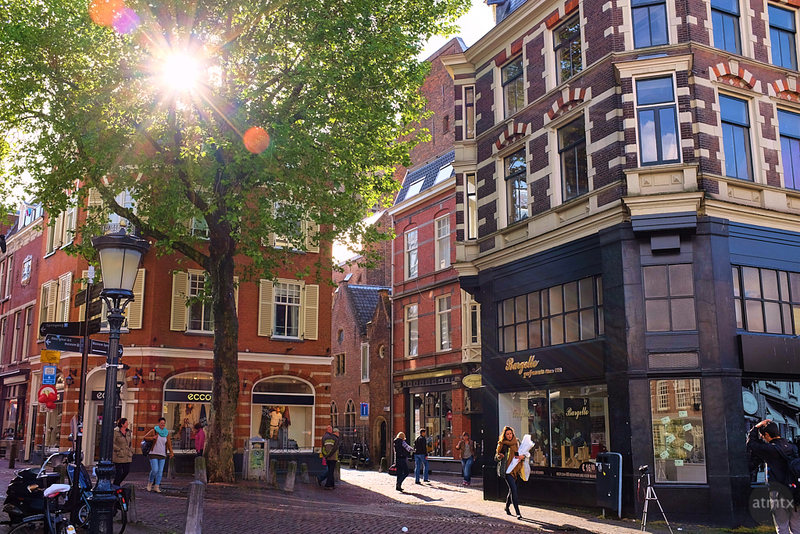 It was sunny when I visited Utrecht, however, allowing to me create this rather optimistic and warm photograph in the May of 2014. In my current series, I’m showcasing my favorites from that trip, shot with the Fujifilm X100S. For being a somewhat frustrating camera, I realized that I made a number of satisfying images. Ones that I enjoying viewing and sharing, over four years later. I’m also enjoying the 35mm equivalent focal length, which was my favorite for a while (and maybe still is). It’s very versatile, great for environmental portraits, details and even urban landscapes. I have come to realize, again, that 35mm is wide enough to take in the scene but compressed enough to put you into the action. Wide angles and even my Cinematics can be dramatic but sometimes distant, pushing away details. At 35mm, there’s a sense of intimacy, even in a city full of strangers. I didn’t realize until this posting that there’s a photographer in the bottom right corner, with his camera on tripod. There’s also a lot more people than I originally thought — I counted ten. For the ultimate in dramatic photos, it would be perfect if I had only one person in frame. The woman in the beam of sunlight formed in the alleyway between the buildings. I wonder what Photoshop’s content aware fill can do? I had a look through your series of photos from Utrecht, and I loved them. Brilliant! Not just technically good, as I am sure they are, but I walked round this city a long time ago and the feeling of the group brought back a lot of memories. Good composition, good lighting, lovely! Thank you for your kind words, Gina. I too enjoyed looking at these photos from four years ago and it also brought back memories for me. That’s the beauty of photography. Often, they become more valuable over time.